Some visitors to the new public library in a northern Swedish town of Umeå received a real culture shock when they failed to properly read signs to the unisex toilets in the gender equal country. A sign hanging between the toilet doors showed a male and a female figure, with arrows pointing in both directions, local media reported. “You usually look for a man or a woman, but here they've got both symbols,” one library visitor, Ida Lundström, complained to Swedish public broadcaster SVT, the Local reported. While some remained at a loss, others rushed to take an advantage of an opportunity. “I think it's great. 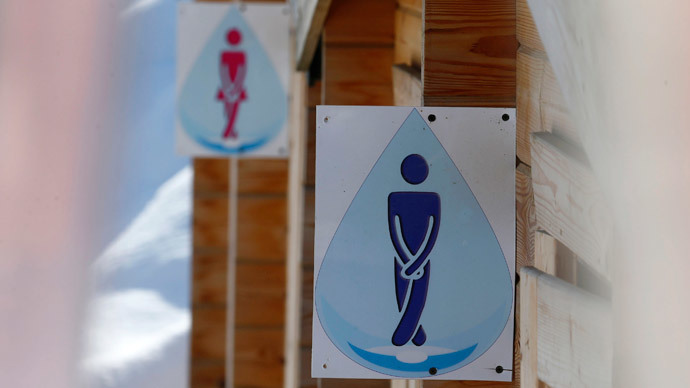 Otherwise the men's toilet is usually available but there's a line to the ladies," Åsa Ågren Wikström told SVT. Meanwhile, the library's section head said the arrows on the new sign actually show that you can use either toilet. “The arrows don't mean that women should go left and men right," Maria Westerlund explained. "But I understand it can be mistaken for a ladies' toilet and a gentlemen's toilet,” she admitted. “It's always very difficult to be clear when it comes to signs – they can always be understood in different ways. But if this ends up causing problems we may have to look at other options,” Westerlund said. Last year it was announced that the groundbreaking gender-neutral pronoun “hen” will be included into the new Swedish dictionary, compiled by the country’s Academy, in 2015, after years of debate. The pronoun will have two uses: for cases when the gender is unknown or irrelevant, or if the information is viewed as irrelevant.